Communication Features Send Secure Cellular Alarm Signals to the Central Station! Welcome DIYers to GeoArm Security! We are a nationwide alarm company, that specializes in Alarm.com professional security solutions. Our GeoArm brand is a subsidiary of the conglomerate AlarmClub.com, Inc. which partnered with Alarm.com back in 2008. Over the years, we have widely established ourselves as a nationwide leader in low-cost Alarm.com business and home security solutions. As one of the first Alarm.com partners in the professional home and business security market, we have heard just about every question that comes up. Together with common goals that business and home security should be simplified, be high technology and cost less money. With the advancements of wireless technologies we have focused on delivering name brand products at everyday low prices. GeoArm clients get free technical support resources that are available, so there is no longer the need for expensive hourly onsite technicians. Our film team got to work developing our proprietary library of Alarm.com how-to-videos and web team developed our support center articles which are geared for even the most inexperienced DIYer. By focusing first and foremost on the customer experience, we have disrupted the home security market. Our commitment to research and development helps ensure that our professional clients get the most cutting edge Alarm.com security systems, security products and alarm monitoring services available. 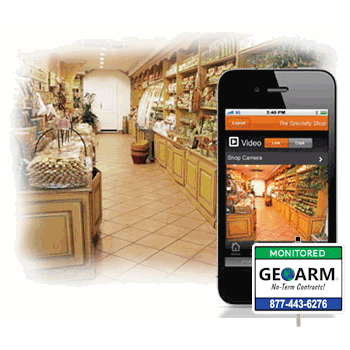 Unlike other companies, GeoArm offers both Alarm.com do-it-yourself and central station alarm monitoring services starting at only $13 a month. There are no contracts, no third party bills and no hidden fees! Multiple Partition Support - For compatible GE Concord and NetworX control panels with multiple partitions, arm or disarm individual partitions via the web, add and assign new user codes to a specific set of partitions, see which sensors are in which partition, and filter the online event history by partition.